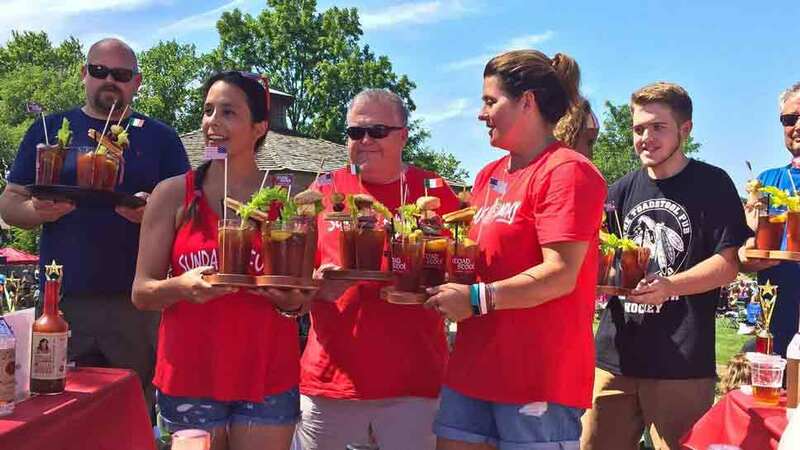 HIGHWOOD – When Bloody Mary Fest first began, some judges got a little too carried away with the tantalizing offerings and were accidentally over served. The following year the judges learned to sip and savor the libations while appreciating all of the nuances. Falberg will be judging again this year, marking his fifth year as a judge at Bloody Mary Fest. He added that the judges often cleanse their palates between tastings with water, beer or occasional vodka on the rocks. As a judge, Falberg said he is constantly surprised how different every Bloody Mary is. Falberg has noticed vendors have become more competitive over the years. “It’s fun watching all of the competitors up their games, and the Bloody Marys keep getting better each year,” he said. Falberg said he “loves a really good Bloody Mary” and was especially excited about last year’s offerings from The Toadstool Pub and Scotty’s on Sheridan. Both establishments are located in Highwood. 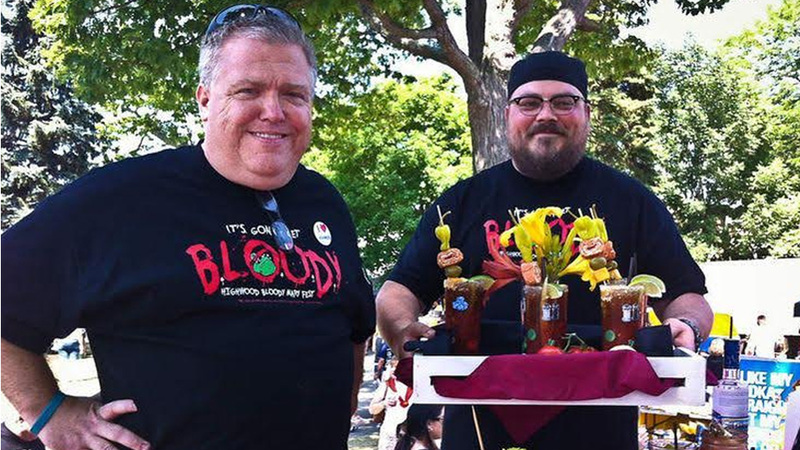 Tom Garrity, owner The Toadstool Pub, has been the Bloody Mary Fest People’s Choice winner for the past six years, while first- time contestant Scott Walner, owner Scotty’s on Sheridan, was the 2017 Judges’ Choice winner. “Tom’s a tough competitor who’s always working to improve his Bloody Marys,” said Falberg. He said Walner ran the downstairs bar at Lovell’s of Lake Forest, so Scotty’s on Sheridan “always has a pack full of Lake Foresters. They love him and follow him everywhere,” said Falberg. In addition to winning the 2017 Judges’ Choice trophy, Scotty’s on Sheridan won a trophy for Best Garnish, as well as a small 3rd place trophy in the People’s Choice category. Walner attributes his success to the creative garnishes and flavorful chef’s mix. He described the garnishes as “over the top” with steaks, shrimp and scallops. He said his team had no idea what to expect and were surprised how busy the fest was. “There were many trips to the store for more ice, limes and vodka,” he added. Walner enjoyed hearing the different bands play while being out in the beautiful weather. The Bloody Marys at Scotty’s on Sheridan follow a different recipe garnished with shrimp, asparagus, celery salt and olives. 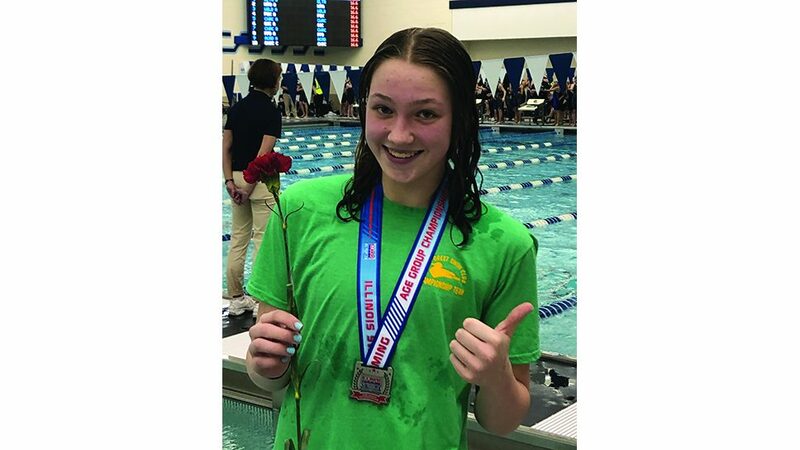 Some of the specialties include barbecue ribs, chicken Milanese and Francisco’s salmon, which is named after Francisco Gomez, general manager, who encouraged Walner to enter the Bloody Mary Fest. The restaurant opened in Highwood almost three years ago. Walner said a new restaurant aptly named Scotty’s on 21 is slated to open at the end of July on the southwest corner of Routes 60 and 21 across from Hawthorne Mall in Vernon Hills. The new restaurant will be a larger venue with a similar look and the same menu. 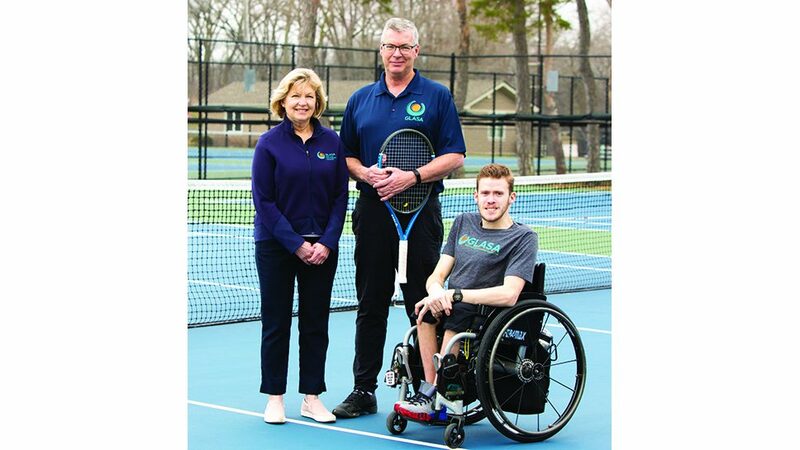 Will Walner hold onto his title in 2018? In the meantime, he’s not giving too much away. “There will be an over-sized vessel with too many garnishes again this year, but we don’t know exactly what those garnishes will be,” he said … or didn’t say. Scotty’s on Sheridan is located at 810 Sheridan Road in Highwood. Garrity, a Highwood native who currently lives in Highland Park, said winning the People’s Choice Award at Bloody Mary Fest for six consecutive years has helped increase business at The Toadstool Pub. “There’s always between 3,000 and 5,000 people every year at the Highwood fest, so it helps our business tremendously during the rest of the year,” said Garrity. He explained that his recipe includes a few different ingredients with a splash of Guinness, while the garnish is made with stuffed peppadew peppers, cheese, pickles, olives and candied bacon. “People sometimes order a Bloody Mary and say hold the Bloody Mary and just give us the garnish,” he added. The Toadstool Pub also received the City of Chicago and State of Illinois recognition as Best Bloody Mary. The Toadstool Pub is located at 327 Waukegan Avenue in Highwood. 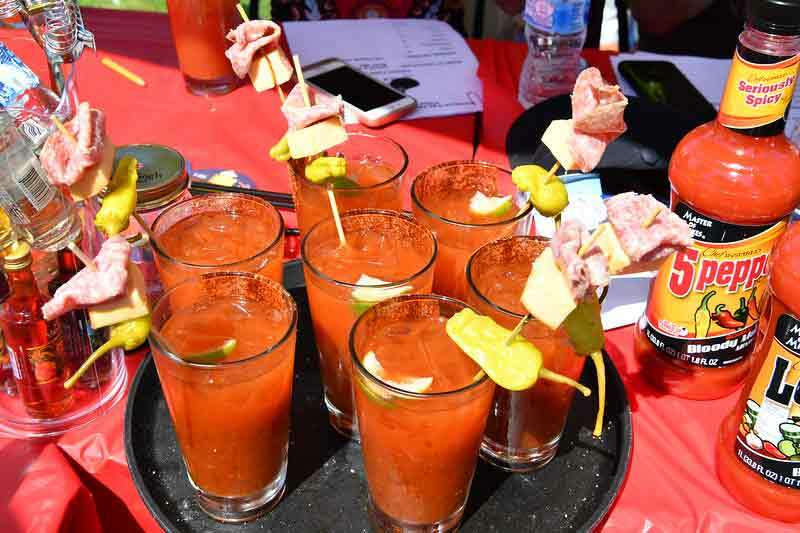 The 9th Annual Bloody Mary Fest will be held on Sunday, July 29 from 10 a.m. to 5 p.m. in Everts Park (130 Highwood Avenue in Highwood). Chicago media personalities will judge the competition, including Lee A. Litas, freelance food and features writer for the Chicago Tribune/Pioneer Press; Sherry Thomas, group media editor of JWC Media, including Sheridan Road, The North Shore Weekend and Daily North Shore; Andrew Nicks, president at 22nd Century Media, Susan Noyes, founder of the Make It Better Foundation, Monica Pedersen, HGTV television host and interior designer, and Eric Falberg, Highwood alderman and founder of Bloody Mary Fest. 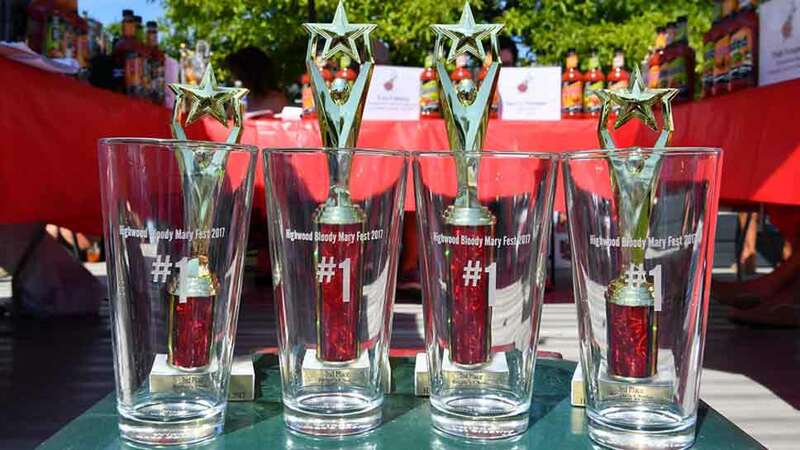 The battle for the Best Bloody Mary starts at 2 p.m. People’s Choice ballots can be cast in front of the judges stage until 4 p.m., and winners of both the Judge’s and People’s Choice will be announced at 4:30 p.m.